Are you looking for best 1.5-ton window ac for your home or office? Well, you are at the right place. 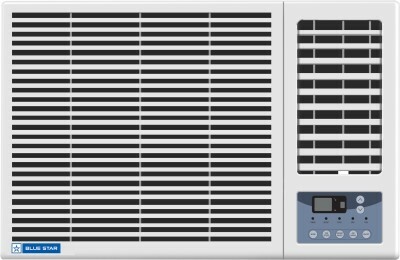 We have compiled a list of top 10 best 1.5 Window AC in India available as of April 2019. Our experts have selected only the best air conditioners from top brands like Voltas, LG, Hitachi, Carrier, and Llyod. All these brands have high-quality air conditioners at decent prices. All the ACs on this list have a capacity of 1.5 ton which is suitable for a mid-sized room. If the size of your room is 10x10 or 12x12 feet (100 - 150 sq. ft.) then you should go for the ACs in this list. If your room is smaller then you can go for a 1 ton AC and if your room is larger than 150 sq feet then probably a window AC of 2-ton capacity would be a good choice. The air conditioners(AC) on this are rated 3 star or 5 stars. 5 star AC consume less electricity but the price will be higher. If you are going to use your AC a lot then you should go for 5 stars rated AC as it will help you to save money on electricity bills. You will find best 1.5-ton Window ACs under 25000 and 30000 on this list. Let's take a look at the list of best 1.5 ton window ac in India. We have provided a brief review of every air conditioner with pros cons, specs and prices. Hitachi Window Air Conditioner is a 3 Star 2018 BEE Rating AC and has a capacity of 1.5 Ton. The Design is good and has a solid build Quality. This window AC comes with Copper Condensor which allows it to cool faster and is long lasting and low repair cost. It has a cooling capacity of 5100W and is suitable for a medium-sized room with 110-150 sq ft area or measuring 10 ft. X 15 ft. This Hitachi Air Conditioner is rated at 3-Star and consumes about 7-8 percent less power than 2 Star AC. This AC adjusts the temperature automatically based on outside temperature. It comes with basic features like auto restart, a timer to switch on and off. It also has Anti-Bacterial and Dust Filter and a filter clean indicator. Hitachi is a great brand with the best network of service centers available all over India. Go for it if you are looking for a Window AC around Rs. 25000. As per our review, it's a powerful Air Conditioner and if you are looking for a 150 sq ft room, you can buy this one. Some of the Hand Picked Stabilizer you can buy with this AC can be checked here. LG is one of the best companies in the home electronics appliances and ranks in one of the top companies manufacturing Air Conditioners. This Window AC has a capacity 1.5-ton and is suitable for a medium-sized room having area of about 110 -150 sq ft. It has a 3 Star BEE Rating and will consume around 0.96 units of electricity per hour compared to 1.02 units consumed in 2 Star rated Air Conditioner. This AC has a 4850 W Cooling Capacity and Power Consumption rated at 1680 W. It comes with a sleep mode feature so it will intelligently maintain the cooling level based on humidity levels. This LG window AC also has an Anti Bacteria and dust filter to send across clean air. If you are looking for an LG branded Air Conditioner at a decent cost, you can look to buy this one considering it has a wide network and offers great after sales service all over India. In terms of the warranty, LG offers 1 Year for Product & 4 Years for Compressor. This is an energy efficient 1.5-ton 5-star air conditioner from Godrej which offers a cooling capacity of around 5000 W and has a power consumption of around 1500 W. The AC is well built and has decent features. It has a dry mode which helps to get rid of excess humidity from the room. It can be very useful in the monsoon season when humidity is high. Godrej is using R22 refrigerant in this refrigerator which is eco-friendly. The AC comes with a 100% copper condenser and connecting pipe. Copper is considered to be a good heat conductor and it adds to the durability factor and also provides fast cooling. You can use the sleep mode feature to get a nice sleep and save electricity as well. The Sleep Mode increases the temperature slightly every hour so you can sleep soundly. The AC has a small display on the front which displays the temperate. Some buttons are also provided to change the settings and temperature. You also get a remote to control all these things. 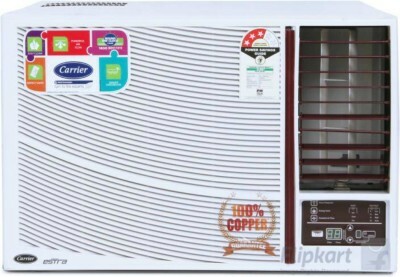 This is a good AC for those who need 1.5 Ton capacity 5-star efficiency Window AC under 25000 to 30000 Rs. This is a 1.5 Ton Window AC from Carrier and comes with a 5-star rating which means you get excellent power efficiency. A higher star rating is good for your wallet and our environment as well because lower electricity consumption means a lower carbon footprint. The AC has a cooling capacity of over 5300W and is suitable for medium sized rooms of area 110 to 150 sq. ft. The AC has a conventional design and comes with all basic features. The AC comes with an LED Display, which is present in its control panel to offer you a more user-friendly experience. Also, this AC features Auto Swing feature that helps in cooling a room/space uniformly by automatically rotating/swinging the air deflector. One interesting feature of this AC is the Smart Diagnosis feature which helps in diagnosing a fault (when there is one) immediately and causes the AC to turn off to prevent it from getting damaged. It will indicate an error code so that the problem can be fixed quickly. Under 30000, this is a great Window AC which offers great performance and excellent power savings. So this was our list of best 1.5-ton window ac in India 2019. We hope it was helpful and you were able to find a suitable air conditioner. With these air conditioners, you are going to need a stabilizer as well. See best stabilizers available on Flipkart for your new air conditioner. If you are confused and not able to decide which Window AC you should buy then take a look at our favorite ACs under 25000 and 30000 below. Hitachi 1.5 ton 5 star AC is our favorite under 30000. It offers excellent power efficiency and great cooling.